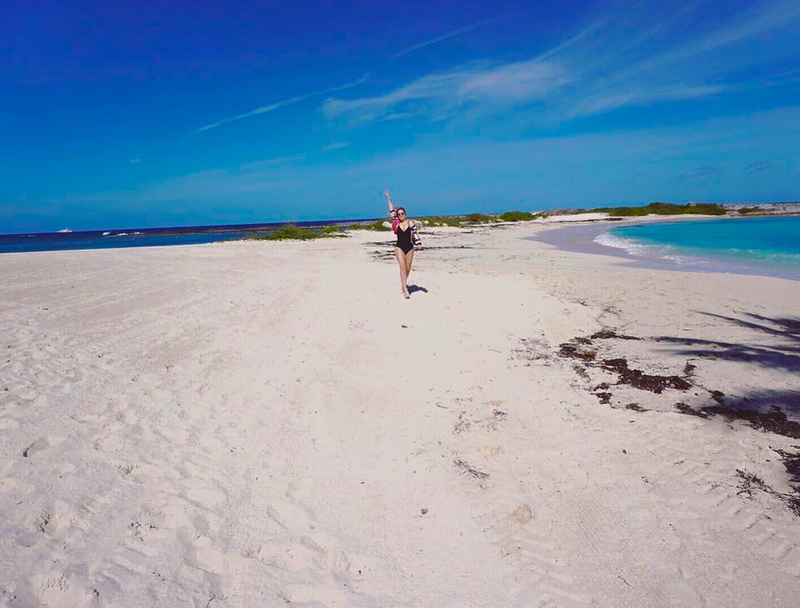 A couple of weeks ago we spent a few days in the beautiful Bahamas, a place that we've always dreamed about visiting! I even remember looking at the world map and circling the Bahamas as 'the dream' place I would always love to visit, so being able to visit this beautiful island was the biggest dream come true. The Bahamas was one of our stops on the most magical cruise trip, the Disney Dream! We spent the day at the Atlantis Paradise Island Resort and it certainly lived up to its name, it was absolute Paradise! We spent the morning at Cove Beach, which was one of many beaches at the Atlantis resort, where we took these photos! Ever since we saw the Mary-Kate and Ashley 'Holiday In The Sun' film, we always said that this hotel was one that we had to visit in our lifetime, that film was one of our childhood favourites! I'm sure if any of you have seen this film you will understand why we were so excited to see this hotel and spend time there! Let us know in the comments your dream destination! Who say's you can't wear a bomber jacket to the beach? Especially if it's got palm tree's on it! I've had this bomber jacket in my wardrobe for a couple of years now and it's one of those timeless pieces that comes out every summer and for every holiday! I purchased this from River Island a couple of years ago but I will see if I can link any bomber jackets similar! It's perfect to throw over swimwear if you feel like you've had a little too much sun or if you want to cover up a bit more on the beach. I also wore this black swimsuit from ASOS and accessorised with hoop earrings and my favourite Ray Ban sunglasses! I get so many questions about these sunglasses so i'll link them down below! Hopefully this have given you guys some inspiration for your own beach looks for the summer! Click here for details for the Atlantis Paradise Island Resort! OMG it looks incredible. Definitely on my list of places to visit too. 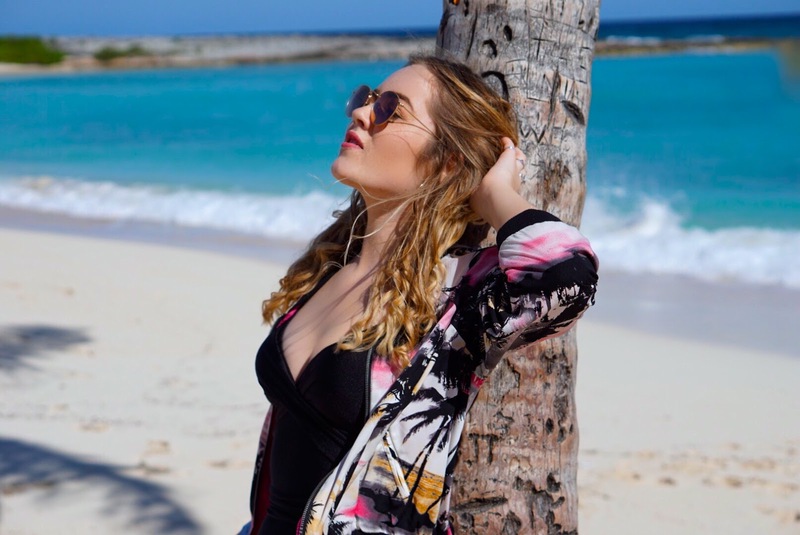 Lydia, this post has me falling in love all over again... first with the Bahamas, and then with that jacket! The Bahamas is somewhere I'd love to visit, but I'd never thought of a bomber jacket as beach wear - until now! Both now firmly on my wish list!! the outfit is so lovely and it looks amazing out there! Oh man the bahamas looked amazing!!! I need to go! The photos are amazing! I'm happy you girls had a lot of fun on this trip! I love reading posts like this! Hopefully I will be able to go to the Bahamas one day. My dream destination is either Greece or Egypt! You look gorgeous - this makes me want to travel SO MUCH! Beautiful pictures and the Disney Cruise looks like a dream! I watched your vlogs of this trip and it made me want to take a Disney Cruise :) I would love to visit the Bahamas. But really, I would love to travel the world. My dream destination is Greece. I love your photos! They are so so so nice ! OMG, I would love to go to the Bahamas! That printed bomber jacket is gorgeous by the way, and it really suits you! it is my dream to go to the bahamas!! this is making me want to go so much more. I love your bathing suit and jacket btw... it looks so good on you.